Eight years ago, executive and board leaders at Sentara Healthcare in Norfolk, Virginia, threw down a strategic gauntlet: It was time to make a big shift and focus on new growth. Since then, the nonprofit health system has been ramping up its presence in its home state of Virginia and continues to evaluate opportunities for partnerships in other states. 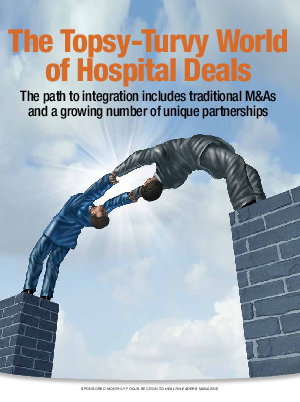 “Sentara’s evolution as an IDN is similar to many other health systems nationally in that our delivery system was largely centered in one geographic region,” says Megan Perry, corporate vice president of mergers and acquisitions. “In 2006, as we looked at the national landscape, we realized that in order to meet the needs of the current communities we served, as well as make the necessary investments in technology and innovation, that we needed to continue to grow.” Between 2010 and 2014, Sentara merged with five hospitals and has entered into new partnerships with Ohio Health, in Columbus, Ohio, as well as with Huntsville Hospital Health System in Alabama. Today, Sentara encompasses more than 100 sites of care, including 12 acute care hospitals, five medical groups, and a health plan; it offers postacute, outpatient, and urgent care services, among others.